Tony Podesta, the brother of Clinton campaign manager John Podesta, has reportedly been offered immunity by special counsel Robert Mueller to testify against former Trump campaign manager Paul Manafort, according to Fox's Tucker Carlson. Manafort and Podesta both made millions together as unregistered agents on a pro-Russia project in Ukraine. While Podesta had the uncanny foresight to retroactively file as a foreign agent last April, Manafort did not, and is currently on trial for his failure to register under the Foreign Agents Registration Act (FARA) - created decades ago to curb Nazi propaganda in the US, as part of a 12-count indictment handed down last October. "In other words, for a near identical crime, Bill and Hillary's friend could escape and emerge completely unscathed while Paul Manafort may rot in jail. Only one of them made the mistake of chairing Donald Trump's presidential campaign," said Carlson. One week after Mueller announced he was targeting Manafort and an unnamed "Company B" in October, Podesta resigned from his position as chairman of the Podesta Group, which he co-founded with his brother Tony in 1988. Manafort and Podesta worked with the Pro-Russia European Centre for a Modern Ukraine (ECMU), a Brussels based think tank tied to former Ukrainian president Viktor Yanukovych which was pushing for Ukraine’s entry into the European Union. While Manafort oversaw the ECMU project during which the Podesta Group made some $1.2 million, Manafort's firm also earned $17 million between 2012 – 2014 consulting for Yanukovych’s centrist, pro-Russia ‘Party of Regions.’ Yanukovych fled from Ukraine to Russia after he was unseated in a 2014 coup. As Mueller began to close in on Paul Manafort, Podesta Group clients became spooked. Before dawn on Monday Oct. 23, 2017, NBC News reported that Mr. Mueller was preparing to indict Mr. Manafort and implicate Mr. Podesta regarding the Ukraine work. The phones started ringing: Clients wanted to know what was going on. The firm’s bank wanted to discuss its account. Podesta's problems began long before Mueller's probe grazed his orbit. During the summer of 2016, SunTrust bank severed ties with the Podesta Group over their work for a U.S. subsidiary of a sanctioned Russian bank - presumably Russia’s Kremlin-owned Sberbank - which paid the Podesta group $170,000 over a 6 month period through September 2016 to lobby against economic sanctions handed down by the Obama administration over the 2014 annexation of Crimea. Fast forward to October, 2017 - just one day after US prosecutors announced the indictments of Manafort and Gates, "an official with the firm's new bank, Chain Bridge Bank, demanded $655,000 in cash or collateral within 24 hours - or it would cut the firm's credit line." Last but not least; in October 2017 a "long time" former Podesta Group executive with "direct personal knowledge" of the operation divulged several other aspects of life inside Tony Podesta's lobbying machine to Tucker Carlson, after he says he was interviewed by special counsel Robert Mueller. Perhaps he felt his testimony would end up on the cutting room floor, which detailed potential money laundering through Tony's art collection, Clinton Foundation links to Uranium One, and claims that the Russians were trying to establish inroads to the Obama White House through the Podestas. Notably, Tony Podesta visited the White House at least 114 times during the Obama administration according to White House visitor logs, and was said to have had ‘special access‘ to the administration through his brother, John Podesta, while lobbying for various pro-Kremlin interests. Manafort worked with the Podesta Group since at least 2011 on behalf of Russian interests, and was at the Podesta Group offices "all the time, at least once a month," peddling Russian influence through a shell group called the European Centre for a Modern Ukraine (ECMU). In late 2013 or early 2014, Tony Podesta and a representative for the Clinton Foundation reportedly met to discuss how to help Uranium One – the Russian owned company that controls 20 percent of American Uranium Production – and whose board members gave over $100 million to the Clinton Foundation. Believing she would win the 2016 election, Russia considered the Podesta Group’s connection to Hillary highly valuable. Podesta Group was a nebulous organization with no board oversight and all financial decisions made by Tony Podesta. Carlson's source said payments and kickbacks could be hard for investigators to trace, describing it as a "highly secret treasure trove." One employee's only official job was to manage Tony Podesta's art collection, which could be used to conceal financial transactions. The Podesta group also earned $180,000 lobbying for Russian-owned mining company Uranium One (U1) during the same period that the Clinton Foundation was receiving millions from individuals connected to the U1 transaction. So - after Russia took control of the Uranium, the Podesta Group received $180,000 to lobby for Uranium One during the same period that the Clinton Foundation was receiving millions from U1 interests, and after Russia took majority ownership in the “20 percent” deal (source – you have to add up the years). 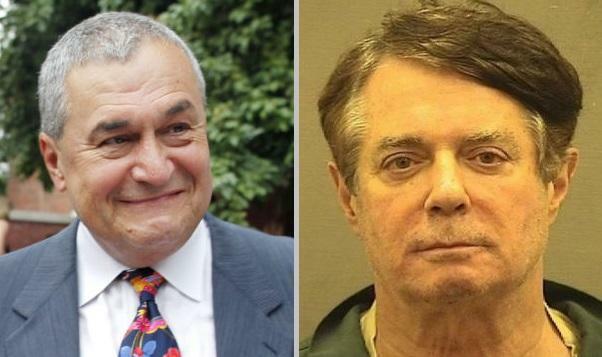 So while Paul Manafort sits in a jail cell for 23 hours per day during his trials (there are two), Tony Podesta has just been offered immunity to flip on him. How Swampy. If Podesta gets immunity to go after Manafort’s old crimes, we will know exactly what this “investigation” is about — clean up and CYA. The Mueller probe is there to save the Clintons & the DOJ/FBI by ensuring that the attention stays focused on Donald Trump. If reports about this immunity offer materialize then fuel will be added to this raging fire. The Mueller probe is an abomination of justice. A disgrace.